Ladies. Drawing. Night. Need we say more? THIS MONTH'S THEME: Flora and Fauna. Bring your medium of choice and spend the evening being inspired by your fellow artist ladies. If you are in the mood to swap supplies, techniques, DO IT! This evening is dedicated to inspiration, camaraderie, and art. No experience is required for this workshop, however, this is a self-propelled evening - no instruction will be given. EVENT IS FREE, but is limited to the first 20 people that sign up. SIGN UP HERE. Please arrive 15-20 minutes early to grab a treat or drink - the cafe closes at 5:30. Herbs are an essential part of every garden. Culinary and medicinal herbs are easy to grow and dry for use all year long. This class will teach you how to choose and grow herbs for cooking, teas, drying and medicine making. We'll talk about perennial and annual herbs and the benefits of growing herbs next to vegetables and flowers. Join me for this FREE class and go home with an herb seedling for your garden! Limited to the first 20 people to sign up. Join us on 5/23 to learn how to Shibori indigo dye! 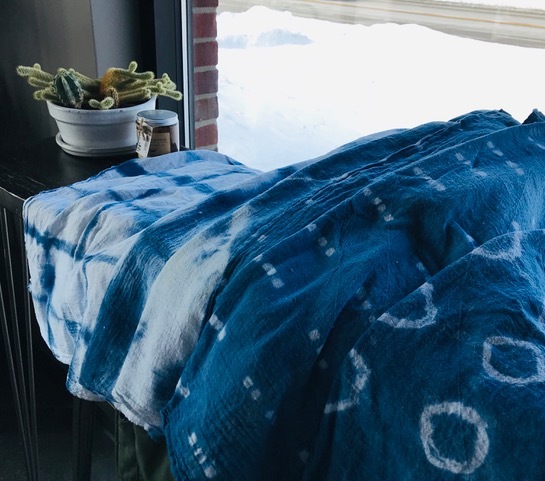 In this class you will learn about the history of this type of dyeing, methods for binding the fabric to create patterns, and you will dye two custom tea towels to take home! Note: The dye used in this class is permanent, so please dress accordingly. Please arrive at the bakery 15-20 minutes early if you want to pick up a treat or drink, we close at 5:30! Watercolors + Flowers = Colorful Creative Flow! I'm running this class again because we had so much fun in the first one! This class will focus on learning the basics of watercolor (washes, wet on wet, dry brush techniques etc.) and use them to create a flower design of your own. All supplies will be provided and students will take home a set of watercolors, two brushes, learning templates and 4 sheets of watercolor paper so you can practice at home! We will be taking our time and learning together so this class is perfect for beginners and kids. 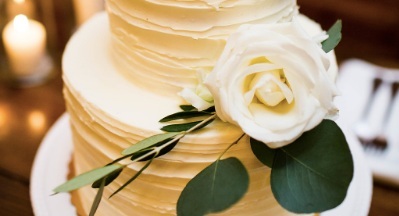 In this class, we will learn the basics of crepe paper flower making! 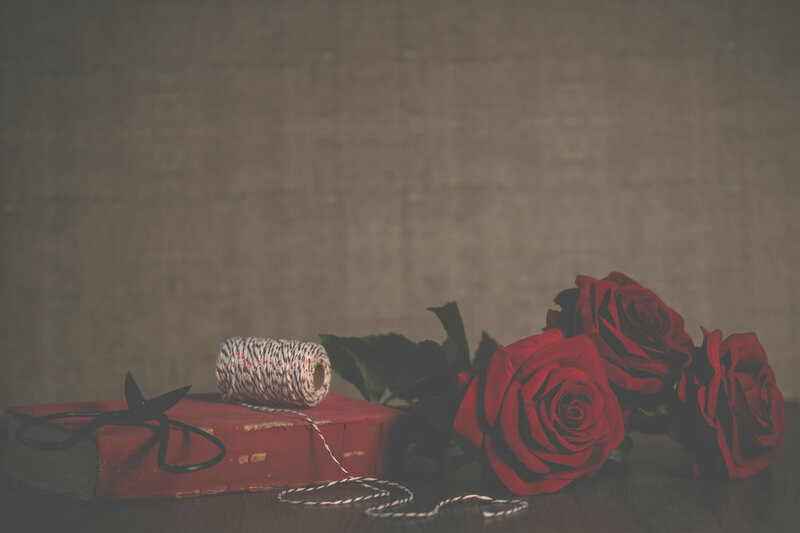 We will supply the paper, wire, glue and floral tape for you to make 3 or 4 flowers during this workshop (with plenty of paper to take home and experiment with!) Kids 10+ are welcome with parent. Sign up below! These two sweethearts are popping-up at the Hop on V-day! Join in the fun from 1-5! Grab a friend and come join us for some carving and stamping fun. I will show you the basics of designing and carving your own rubber stamp and then guide you through the process of making your own Valentine cards, gift tags, or little prints. Each participant will get their own thick block of rubber to carve, six flat cards with envelopes, and a few blank gift tags. I will supply the carving tools, ink, and an assortment of my own little stamps to experiment with. You've seen the cute pumpkin centerpiece photos in magazines and online, now you can make you own! We'll be designing and filling a pumpkin with an array of succulents in every shape and color. The centerpiece you create will be perfect for your Thanksgiving table! And the succulents will last long after the holidays are over, giving you a perfect low-maintenance house/office plant. A Hopscotch treat and beverage will be provided as part of this class. She’s back! Priscilla will be joining us again with her Intro to Brush Lettering Class! 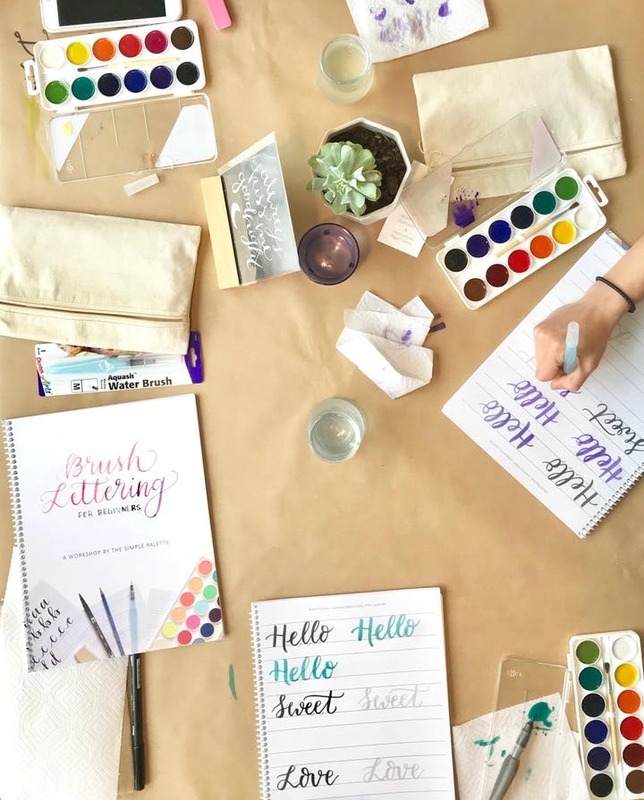 Bring a friend and learn the basics of Brush Lettering using brush pens and watercolors, with The Simple Palette artist, Priscilla Putman! We will start with learning basic brush strokes and practicing the brush lettered alphabet, and end the class by lettering a quote on watercolor paper! Each attendee will take home their own lettering practice booklet and brush lettering kit - which includes a brush pen, specialty watercolor brush, watercolor paint set, an artist pencil and eraser! *Make sure to buy a ticket in advance to reserve your spot! Stop in the shop prior to the class to browse and buy a treat or a drink, as they close at 5:30 for regular business. This class is for beginners as well as advanced watercolor artists. We'll learn the basics of painting with watercolor, one of the easiest, and most fun way to paint! 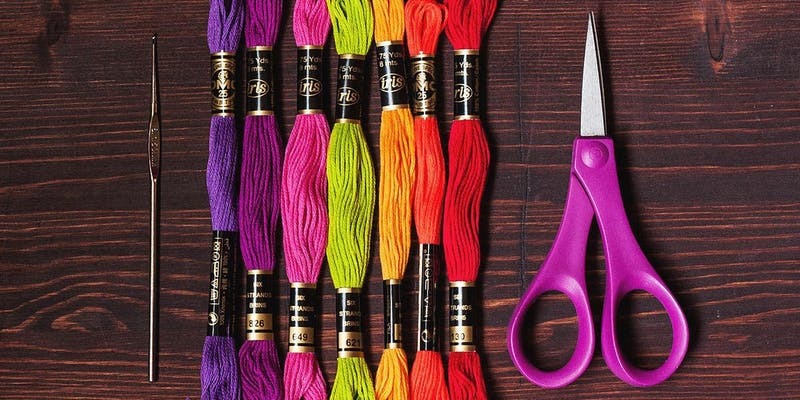 All supplies are provided and you will take home a finished piece of artwork. Types of paint, brushes, and paper will be discussed as well as various techniques for painting with watercolors. 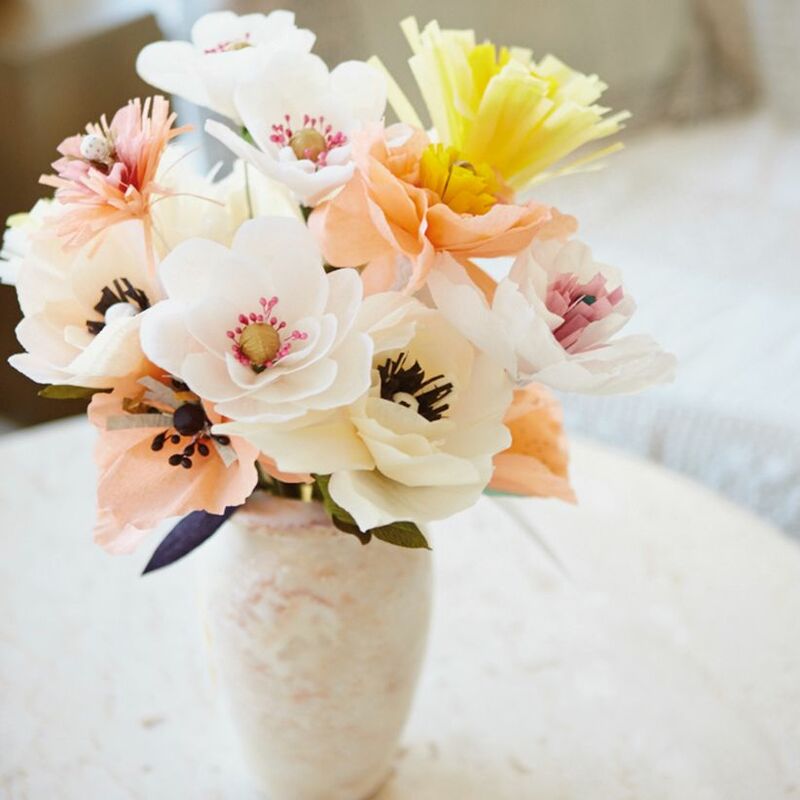 We'll have fresh flowers from Old Town Flowers to inspire and guide your work! Join us for a fun and relaxing way to get creative with flowers and watercolors. Light snacks and beverages provided. Kids 10 and older are welcome to attend with an adult. Kids must have their own ticket. No refunds available. About the teacher: Joan Jach is the owner of Old Town Flowers, a local, urban flower farm in Champaign. She is a self-taught artist with a background in science education. Joan has used watercolors since she was old enough to hold a paintbrush and thinks that painting with watercolors outside in Nature is the BEST! Nurture your creative soul and join artist Dana Overman for an evening of word inspiration and tap into a fun and creative way to explore how you can use words that paint a picture of colors and feeling. Dana believes that words are important part of our society, culture and community providing space to heal, encourage, celebrate, and connect people. Explore the beauty, power, joy of words through thought and writing exercises. Begin to learn how to deconstruct some of the norms that keep us from unleashing our pose and poetry creativity. Tap into a creative muscle that can inspire us in our overall creative process. Contact Dana Overman at danaovermanstudio@gmail.com for any questions you may have. Moth’s are the new butterfly, duh - and should be celebrated! In this workshop we will be using a variety of techniques to achieve a cute watercolor painting of a moth. We will practice stencil making, sketching and painting in this class. No experience is required, just a love for moths! Kelly Hieronymus is a local artist and color enthusiast who has created a fun color-filled class to celebrate artists of all skill levels and ages. Kids 10+ are welcome to attend with a parent present. Participants get a pastry of their choice! 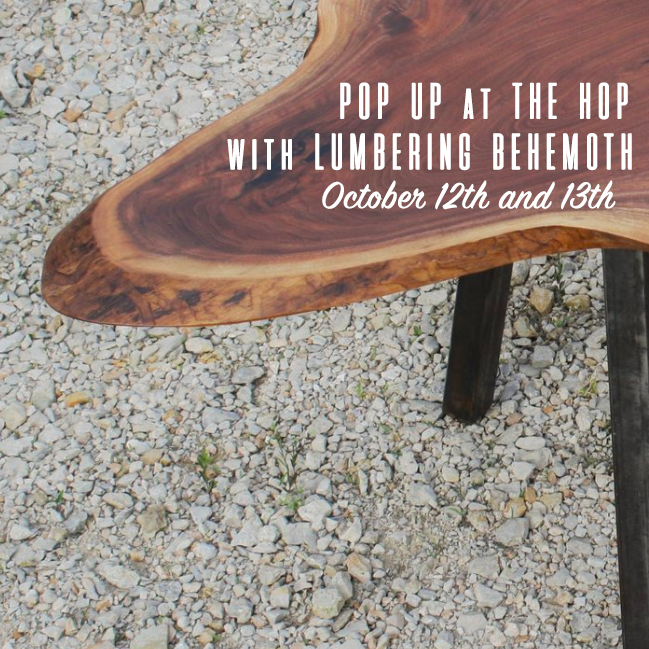 Our pal, Jim Standerfer is coming to Champaign to have a pop-up in the backyard of the shop! He creates unique, function-forward designs in furniture, lighting, housewares, and both commercial and residential spaces. Pieces will be available for purchase and we will be having a “Meet The Maker” Q&A Saturday afternoon at 3pm. Bring your medium of choice and spend the evening being inspired by your fellow artist ladies. If you are in the mood to swap supplies, techniques, DO IT! This evening is dedicated to inspiration, camaraderie, and art. No experience is required for this workshop, however, this is a self-propelled evening. $5 fee will cover a treat or drink! To learn more about Ladies Drawing Night, click there. We're back for a second Hopscotch Clothes Swap event! All clothing must be dropped off on Saturday September 15 or before the swap on September 16th. No additional items will be allowed after close on Sunday. We will trade your clothing for an entrance ticket for the swap at the time of the drop-off. Please bring only wearable and clean women's clothing, shoes and accessories. All leftover clothing items will be donated to Courage Connection.